Intel used to be the de facto ruler of the processor world, crafting the best processors on the market – no contest. However, with Ryzen, the game changed entirely. And, now that AMD Ryzen Threadripper 2nd Generation has been out for a while, Team Red is dominating the market, more than doubling the sales of Intel’s chips, according to a German retailer. As far as the current generation goes, though,we’ve had a chance to review a wide range of Ryzen 2nd Generation processors from the Ryzen 5 2600X to the powerhouse that is the Ryzen 7 2700X, we know AMD isn’t holding back as it pushes power and value even further. We have also heard rumors of a Ryzen 7 2800X, which should give the recent Coffee Lake Refresh processors a run for their money – but, with the advent of AMD Ryzen 3rd Generation, likely at Computex 2019, we doubt that particular processor will ever surface. 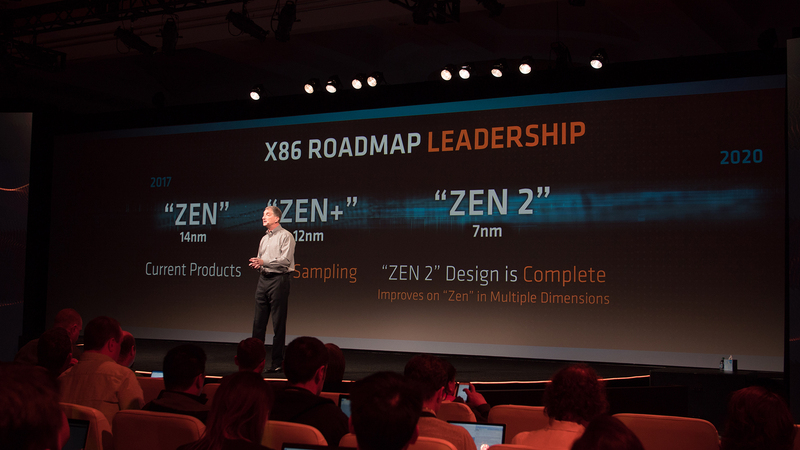 Plus, AMD is hard at work on Zen 2, the architecture behind the next generation of Ryzen. And, according to the latest rumors, we could see up to 16-cores on the flagship, and clock speeds up to 5.0GHz. If any of this is real, the processor world will shake when these next-gen chunks of silicon drop sometime in mid-2019. The wait for the new AMD chips is finally over. The first generation Ryzen processors shipped out in March 2017 and rolled out throughout 2017. Now, Ryzen 2nd Generation chips have launched at around the same time of year, on April 19, 2018. Beyond the first few chips AMD released, the timeline points to released for both the 2nd Generation Ryzen Pro and Ryzen Threadripper chips throughout the second half of 2018. Ryzen Pro chips are designed for business and IT use-cases, with up to 8-cores and 16-threads. Ryzen Threadripper 2nd Generation is the ‘big daddy’ of AMD’s offering with up to 32-cores for die-hard creative types. AMD also announced a Ryzen 5 2500X and Ryzen 3 2300X, but at this point we don’t think these mid-range chips will ever make it to market. Intel’s Coffee Lake Refresh has been out for a few months now, and Ryzen 3rd Generation chips are supposedly right around the corner at Computex 2019. Those are all desktop chips, and AMD has launched the Ryzen 7 2700U, along with Ryzen 5 and 3 parts earlier this year. And, laptops are starting to roll out with these chips. And, even though AMD Ryzen 3rd Generation is right around the corner, AMD may be releasing 50th anniversary editions of some of its parts, including the beloved Ryzen 7 2700X. AMD plans for its second generation of Ryzen chips to be just as affordable as the first batch. Granted, delivering more affordable CPUs has always been AMD&apos;s edge, but for the first time in years, the cheaper Ryzen chips could honestly hang with, if not surpass, Intel&apos;s offerings. AMD has decided to continue its course with the 2nd Generation models. It was imperative that it delivered affordable, high-performing CPUs. And while we haven’t seen the pricing for the mid-range chips, what we’ve seen so far seems to fall in line with the pricing for the first generation. Last year, the quad-core Ryzen 3 1300X debuted at $129 (£112, AU$169), while Intel&apos;s Core i3 7350K went for $149 (£169, AU$299). Bump up to the hexa-core Ryzen 5 1600X, and we saw it offered for $249 (£249, AU$359) – compare that to the quad-core Intel Core i5-7600K at $239 (£219, AU$339), although you lose a couple of cores in the process. We saw the biggest price difference with the Ryzen 7 1800X, which at $499 (£500, around AU$650) was nearly half the price of Intel&apos;s Core i7-5960X/6900K. Of course, this lead to Intel introducing a more affordable Intel Core i7-8700K and Intel Core i7-7820X. Meanwhile, the AMD Threadripper 1950X came in at $999 (£999, AU$1,439) and delivered even stronger performance than Intel&apos;s like-priced Core i9-7900X. Of course, AMD recently dropped its Ryzen prices across the board alongside the 2nd Generation announcement, keeping things competitive with Intel as the two companies wage war for your CPU-buying dollars. Ryzen 2nd generation processors offer quite the generational leap over their predecessors. They&apos;re built using a new 12-nanometer process, which will cram in even more transistors and thus provide more raw speed along the way. According to AMD 12nm process results in an approximately 16% performance increase and 11% better lower power draw over the original Ryzen&apos;s 14nm process. We have finally seen some rumors swirling around about the Ryzen 2nd Generation APUs, which will succeed the Ryzen 5 2400G and Ryzen 3 2200G. According to PCGamesN, the next generation APUs will be coming out next year, and will feature the same Zen+ 12nm architecture as current Ryzen 2nd Generation CPUs. This could mean APUs could see a similar boost to performance as we saw when the first generation Ryzen chips were succeeded. AMD says that the Ryzen 2nd Generation chips will be the smallest and fastest desktop processors to date – lofty promises, but ones that are sure to excite PC enthusiasts and users of all stripes. Ryzen 2nd Generation chips will deliver higher clock speeds and introduce the enhanced Precision Boost 2 technology to boost performance during high-drain scenarios. And, now that we’ve gotten our hands on the Ryzen 7 2700X and the Ryzen 5 2600X, we know that AMD has succeeded in pushing its specs. The 2700X with its 8-cores, 16-threads and speedy boost clock of 4.3GHz that outperforms the Intel Core i7-8700K, AMD has fully embraced the enthusiast market. Even the lower-end Ryzen 5 2600X pushes performance into the next generation with 6-cores, 12-threads and a 4.2 GHz boost clock. We’ve also seen leaked benchmarks for the yet-to-be announced Ryzen 3 2300X and Ryzen 5 2500X. The former is apparently a four-core, four-thread processor clocked at 3.5GHz and a 4.0GHz boost clock. Meanwhile the rumored Ryzen 5 2500X is a four-core, eight-thread chip, featuring a 3.6GHz core clock, boosting up to 4.0GHz. We don’t have any pricing or release date information on these rumored chips, but we assume they’ll be great entry-level and mid-range options, respectively – when and if they come out. Recently, we saw a leak from ASRock pointing to the existence of some low-power E-series Ryzen 2nd Generation chips, the Ryzen 5 2600E and Ryzen 7 2700E. These chips will have a much lower 45W TDP and feature an 8-core design for the Ryzen 7, and 6-cores for the Ryzen 5 – according to the rumor reported by Wccftech. But, it doesn’t end with the desktop chips. AMD has also released Ryzen 2nd Generation mobile chips in the Ryzen 7 2700U, Ryzen 5 2500U, Ryzen 3 2300U and Ryzen 3 2200U. These all have Vega graphics packed in, meaning you can comfortably do some light gaming on them. The two higher-end chips are four-core, eight-thread processors with boost clocks of 3.8GHz and 3.6GHz for the Ryzen 7 and Ryzen 5, respectively. The Ryzen 3 2300U and 2200U are four-core, four-thread chips with 3.4GHz boost clocks. The core difference in these two chips is that the former features stronger Vega graphics, while the 2200U has a higher base clock of 2.5GHz. AMD Ryzen 2nd Generation is a distillation of everything AMD wanted to do with Ryzen. And, if the specs of the early Ryzen 2nd Generation CPUs are anything to go off of, we’re very excited to see what this lineup looks like by the end of 2018. AMD has a very technical primer on Precision Boost 2 from its Ryzen Mobile Processor with Radeon Vega Graphics, in case you want to dig into the specs. We&apos;ve seen some SenseMi improvements in AMD&apos;s recent Ryzen-based desktop APUs, so it stands to reason that we&apos;ll see similar performance and efficiency increases in the Ryzen 2nd Generation line. That could include optimized power usage through Pure Power smart sensors and improved overclocking potential from Extended Frequency Range 2. Anyone looking to upgrade from Ryzen Gen 1 will be happy to know that AMD has kept the same AM4 socket intact, so you won’t need to buy a new motherboard to slot one of these CPUs into your machine. There is also an enhanced X470 chipset that’s optimized for Ryzen 2nd Generation with lower power consumption. Keep in mind that AMD calls the heart of Ryzen 2nd Generation the Zen+ architecture, rather than Zen 2. What’s the difference? Well, Zen 2 will be an entirely new architecture built on a 7nm process, which – as you can imagine – could provide a world of difference when it comes to power and performance. AMD&apos;s roadmap shows the Zen 2 and Zen 3 (listed at "7nm+") cores coming somewhere between the release of the Zen+ and the year 2020, so that&apos;s more likely to appear in 2019. Zen 2 design is reportedly complete at this point, and it "improves on Zen in multiple dimensions" according to AMD. And the Zen 3 is "on track," as well. AMD could be primed to shake up the CPU industry all over again with the Zen 2, but that&apos;s not what we&apos;ll see this year: Zen+ is what&apos;s powering the Ryzen 2nd Gen chips. Even so, there&apos;s plenty of reason to be excited for the Ryzen 2nd Generation chips, especially if you’re in the market for a PC upgrade this year. And, even with Intel on the defensive, it’s safe to say that AMD knocked it out of the park.